"Should we use taxes to deter financial speculation? Yes, say top British officials, who oversee the City of London, one of the world’s two great banking centers. Other European governments agree — and they’re right." "It would be a trivial expense for long-term investors, but it would deter much of the churning that now takes place in our hyperactive financial markets. This would be a bad thing if financial hyperactivity were productive. But after the debacle of the past two years, there’s broad agreement — I’m tempted to say, agreement on the part of almost everyone not on the financial industry’s payroll — with Mr. Turner’s assertion that a lot of what Wall Street and the City do is “socially useless.” And a transactions tax could generate substantial revenue, helping alleviate fears about government deficits. What’s not to like?" Read the rest here. As he explains, its opponents who say it's unworkable and doesn't address the real problem, are plain wrong. "Since the aim of policy is to recapitalise the banks, the tax should not reduce their ability to do so. It would be far better then to impose a tax on contributions made to the bonus pool. There is no public interest in such payments." What is needed, at the end of day, is leadership. 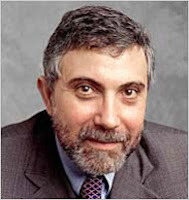 Prof. Krugman and TJN are exactly right to say that a well implemented transaction tax would reduce churn. Beyond this, I can't see a persuasive case for it though. To quote the article, "A transactions tax wouldn’t have stopped lenders from making bad loans, or gullible investors from buying toxic waste backed by those loans". So we still have that problem to deal with. And don't expect to be able to raise a significant sum in terms of public finance (even in the UK). If it could raise 1% of GDP, that wouldn't put much of a brake on the FIRE (Finance, Insurance, Real-Estate) economy. But is it even possible to get this small sum (just £16bn/annum)? Remember even a few years ago, net profit from money creation in the UK was £72bn, IIRC. The problem of course is that the transaction rate drops as the tax rate goes up. The profitability of the FIRE sector as a whole is only modestly reduced. What transaction tax revenue do you envisage, TJN? So Mr Turner is right that much of what the sector does is "socially useless", but a transactions tax will help the industry cut costs, with little effect on profits/bonuses. Of course the real solution is to return the private credit-creation privilege to the sovereign states. Much of the industry would fall away rapidly. Cutting the FIRE sectors from 20% to 2% of GDP (as some economies need) is a 90% cut. Transaction taxes may make some people feel good, but the real solution lies elsewhere!